Watch the short video below to learn how to setup an automatic Email response and 'Thank You' page to show after the form is submitted. From within the Form Designer, expand the Post Processing menu in the toolbar and choose AutoResponder Emails & Redirects. Click the Add AutoResponder Profile button. 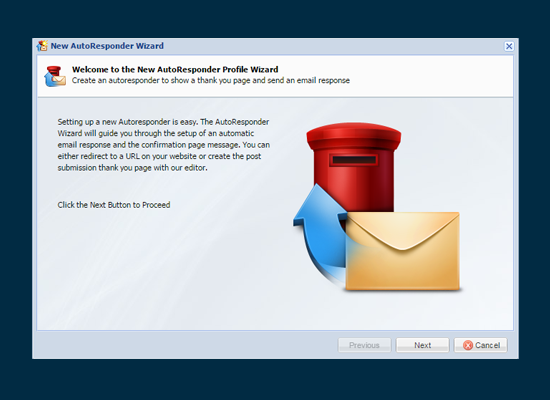 The New AutoResponder Wizard opens. Choose Standard AutoResponder, then click the Next button. Enter 'Thank you for registering' as the Profile Name. Click the Next button. In the Email Field, select the email address field from the list of form fields. This is the field that contains the email address to which the response will be sent. Enter your email address in the From Address field. Finally, click the Launch Email Editor button to edit the email. The AutoResponder Email Editor opens. Type 'Hi' and then click the wildcard icon in the toolbar. Click the Name field and then close the window. This will insert the value entered in the Name field of the form, personalizing the email. We're keeping this response email short for this example. In the real world, you would continue to personalize the email using wildcards and your own content. Click the Save button to close the AutoResonder Email Editor, then click the Next button. The final step in creating the AutoResponder Profile is to define the 'Thank You' page that is shown after the form is submitted. Click the Launch Thank You Page Editor button to open the Thank You Page Editor. From the editor toolbar, click the Templates icon, and choose the 'Success' template to show a pre-formatted response. You can also edit the Thank You page to personalize it or add your own content. Click the Save to close the Thank You Page Editor, and then click the Finish button to complete the setup. Now, each time the form is submitted, the person completing the form will receive an automated email response, and they'll see your 'Thank You' page message.